During university, I lived in South Carolina, the birthplace of comfort food. Rich, delicious grub is the norm there and Thanksgiving was, of course, no exception. I’ll never forget the decadent mountains of food set out on the holiday dinner table. The dish that made me lose all control? A sweet and buttery yam casserole topped with mini marshmallows made by a friend’s (Southern) mom. Luckily for me, she passed along the recipe. The dish was so delicious, I shouldn’t have been surprised to see a cup of sugar and a cup of butter in the ingredient column, but of course I felt a bit guilty. This dish could easily pass as a dessert! Behold, a twist on this traditional recipe that I’m excited to share with you as part of a ‘Canadian Food Trends’ recipe series I’m working on with Loblaws. 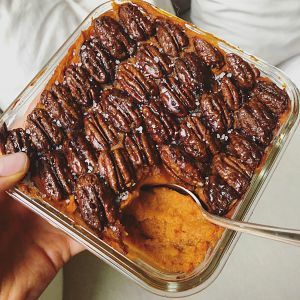 This month’s theme is ‘Rediscovering Traditions’ and I’m excited to get all nostalgic and gorge on this slightly healthier, refined sugar-free, vegan version of my favourite yam casserole, which I’ve topped with sweet and salty candied pecans and infused with orange zest. Hope you love it as much as I do. All ingredients are from Loblaws City Market. Thanks to Loblaws for sponsoring this post!! Place a medium-sized pot of water on the stove and bring to a boil. Peel yams and chop into quarters. Place in boiling water and cook until fork-tender, about 9 minutes. Once cooked, drain water and add butter, zest, sugar, spices, and salt to the pot. Using a potato masher or a handheld blender, puree the yams until smooth. Grease a casserole dish (mine was 6 x 6”) and add yam puree. Top with candied pecans and bake for 30-40 minutes. Garnish with a small sprinkle of fleur de sel, if you like them salty. Place coconut sugar, water, spices and salt in a frying pan and cook over medium heat, stirring continuously. Once combined and gently bubbling (about 1-2 minutes), add in the pecans and continue stirring until they’re coated. Cook for 3 minutes (careful not to burn them). Once pecans are coated, transfer to a piece of parchment paper and separate so they don’t stick together (careful, they’re hot!). Once they’re cold they’ll be less sticky and easier to handle. Arrange on casserole and enjoy!